There are 101 Assisted Living Facilities in the Tempe area, with 9 in Tempe and 92 nearby. The average cost of assisted living in Tempe is $2,963 per month. This is lower than the national median of $3,346. Cheaper nearby regions include Mesa with an average starting cost of $2,837. To help you with your search, browse the 503 reviews below for assisted living facilities in Tempe. On average, consumers rate assisted living in Tempe 4.1 out of 5 stars. Better rated regions include Scottsdale with an average rating of 4.2 out of 5 stars. Caring.com has helped 6 families in Tempe find high-quality senior care. To speak with one of our Family Advisors about assisted living options and costs in Tempe, call (855) 863-8283. Located in the Phoenix metro area, Tempe, Arizona offers seniors a variety fun attractions: Arizona State University and Sun Devils' football, Tempe Town Lake, Desert Botanical Gardens and Downtown Tempe — to name a few. Seniors in Tempe, 9.4 percent of the population, will find 58 assisted living facilities in the Tempe area and its surrounding communities. Eight of those facilities are in the city of Tempe while 50 dot the landscape of its surrounding communities. Many of those communities are in the city of Phoenix while smaller towns like Scottsdale, Mesa, Chandler, Gilbert and Glendale also have their share of assisted living communities. The weather in Tempe is perfect for heat-loving seniors, but there are some cool weather months too. In January, the temperature averages 42 degrees, while in July the average high is 105 degrees. There are about 300 sunny days throughout the year in the city, compared to the national average of 200 per year. There are several medical facilities in the Tempe area and the best medical care in Arizona is right across the Salt River in Phoenix. Whatever medical needs seniors have, they can find care in Tempe. Transportation is well-managed in Tempe, and there are 16 bus lines and a light rail system. ADA Paratransit is an option for seniors with disabilities, and Dial-a-Ride is available as well for seniors who can't use the city's buses. The cost of living in Tempe is eight percent higher than the national average. Yet, the cost of groceries, health care, and miscellaneous costs are all a bit lower than the average. The cost of assisted living care matches the national average of $3,750 per month. Crime in Tempe is quite a bit worse than the national average. Property crime in particular scores at 60.5 while the national average is 38.1. Air quality is rated 47 out of 100 in Tempe, compared with the US average of 58. This metric is based on EPA standards known as the National Air Toxics Assessment. Assisted Living costs in Tempe start around $2,963 per month on average, while the nationwide average cost of assisted living is $4,000 per month, according to the latest figures from Genworth’s Cost of Care Survey. It’s important to note that assisted living rates in Tempe and the surrounding suburbs can vary widely based on factors such as location, the level of care needed, apartment size and the types of amenities offered at each community. 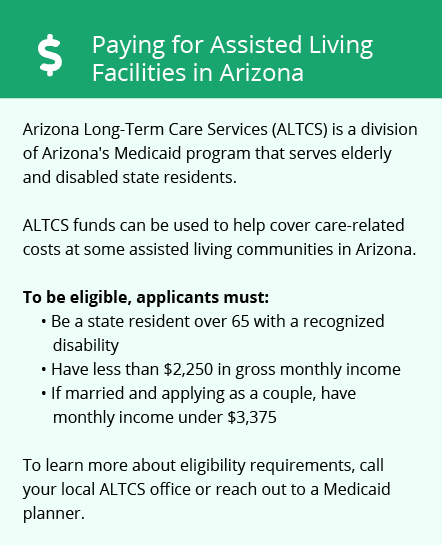 The Arizona Long-Term Care System (ALTCS) is a managed care program which is part of the Arizona Health Care Costs Containment System. Seniors living in assisted living homes can use this program to get financial assistance based on their individual needs. To see a list of free assisted living resources in Tempe, please visit our Assisted Living in Arizona page. Tempe-area assisted living communities must adhere to the comprehensive set of state laws and regulations that all assisted living communities in Arizona are required to follow. 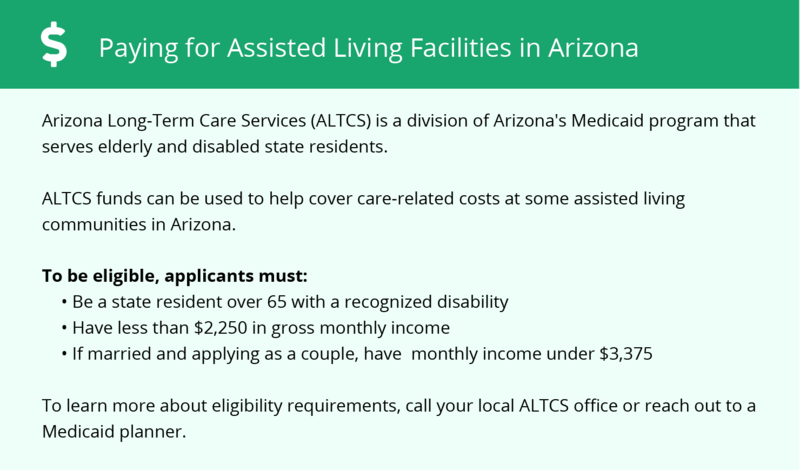 Visit our Assisted Living in Arizona page for more information about these laws.